Hi friends! 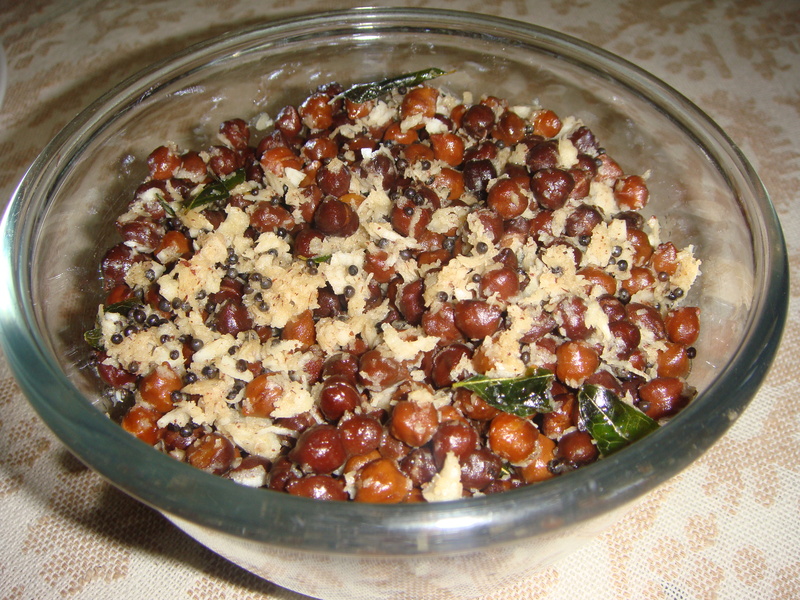 Make a variety of sundal for breakfast / meals or snacks. It is very easy to prepare and an good for health snack. It is a perfect guilt free snack which can be served as a snack or as a side dish with main meals or breakfast. Soak Kala Chana overnight or for 8-9 hrs and pressure cook (after the pressure is formed for twenty minutes on slow heat) with salt until soft. The Chana should be soft and firm to touch. Strain the chanas and keep aside. (we can use this drained water to make healthy soup or rice pulao). For tempering, heat oil in a kadahi/ wok add mustard seeds, wait till mustard starts crackling add hing and curry leaves , urad dal and red chillies and let them fry a bit. Add grated coconut fry it for another minute. Add the cooked kala chana and mix well switch off the stove. Serve Sundal hot, warm or cold as a snack . If serving with meals garnished with finely chopped onions and tomatoes. Inclusion of fiber-rich foods in your diet can greatly contribute to weight loss. Black chickpeas are rich in both soluble and insoluble fiber. Black chickpeas contain a unique combination of antioxidants, anthocyanins, delphindin, cyanidin and petunidin as well as phytonutrients and ALA that maintain the health of blood vessels and prevent oxidative stress, thereby reducing the risk of heart disease. Black chickpeas contain considerable amounts of folate and magnesium. Folate lowers the homocysteine levels thus minimizing the risk of narrowing of arteries by plaque formation, blood clots, heart attacks and strokes. The soluble fiber in black chickpeas binds the bile acids and prevents them from being absorbed by the body, thus reducing cholesterol levels. Daily consumption of around ¾ cup of chickpeas helps to decrease LDL cholesterol and total cholesterol triglycerides. Moreover, the dietary fiber of black chick peas is superior to that found in other foods. The soluble fiber in black chickpeas controls the absorption and release of blood sugar. Moreover, chickpeas have low glycemic index of 28 to 32 which means that the carbohydrate in them is broken down and digested slowly. This aids in weight loss by controlling appetite. The low GI causes blood sugar to rise moderately and slowly leading to lower blood sugar levels. Consuming ½ a cup of black chickpeas a day is effective in controlling blood sugar in just a week. As already stated, the carbohydrates in legumes such as black chickpeas are digested slowly, thus reducing the blood sugar levels. This contributes to insulin resistance, thereby reducing the risk of getting type-2 diabetes. Being a rich source of iron, black chickpeas can prevent anemia and boost your energy levels. This is particularly beneficial for pregnant or lactating women as well as growing children. Iron plays an important role in the formation of hemoglobin by transporting oxygen from the lungs to all body cells and is an important component of enzyme systems for energy production and metabolism. Black chickpeas are an alternative source of protein for vegetarians as these legumes in combination with whole grain or whole wheat protein, provide significant amounts of protein which are comparable to that of meat and dairy as well as devoid of high calories or saturated fats.